Who Should Buy This Ariens 920021 Snow Blower? People with huge driveways or uneven terrain. However that’s not the only reason why you should get it. 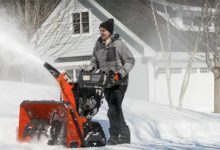 You’ll want this Ariens snowblower if you work with a variety of uneven and unpredictable non-flat surfaces. Adjusting the track angle, you can choose to do flat surfaces like asphalt, or you can adjust it up a click or two and handle unpaved surfaces. Just a note though, just because this beast can handle unpaved surfaces, doesn’t mean you shouldn’t watch out for flying rocks or gravel. Don’t worry about your machine though, this thing will pick them up and spit them out like nothing. Surrounding areas may not be so lucky though, so keep an eye on your cars or glass windows. We always recommend reading the Ariens manual before operating their machinery, but here’s a quick summary of the process you can expect to run through. For best results when starting the Ariens Compact 24, make sure you prime it about three times and rotate the choke to “start” before you operate it, or you may struggle trying to get it to run. Once you’ve done this, you can just pull the pull string or even press the electric start. Yes, we said electric start. To use the electric start, you’ll have to plug the power cord into an outlet and repeat the above steps and then press the electric start button. Unlike some of the other snowblowers, you won’t get a fancy joystick to control where the snow is thrown. Instead, it’s controlled by two controls. To operate, you’ll push down on the auger lever and until you release your driver lever, you won’t be able to adjust the chute. It throws snow up to 40 feet, but that’s dependent on the snow. Heavier and wetter snows may not be so far. The stuff at the end of the driveway is no problem for this snowblower either. You can take the pins out of the tires to help make turning easier, but it’s pretty easy to maneuver as it is. The biggest drawback of this unit is that it can be difficult to turn or manoeuvre when you first start using it. Once you get it moving, you’re going to keep moving. If you’re worried about it running away from you on steep declines, you don’t have to worry. Walking down a hill or a sloped incline is easy. Size is always an issue when you’re picking out a unit. You want something that can handle whatever you throw at it, but at the same time, you also need to store it away once you’re finished using it for the year. Bigger machines will definitely tackle the job, but finding space to put them in can be difficult. The Ariens 920021 Compact machine is big enough to handle most jobs, but it won’t take up your entire garage either. When winter is finally over, you can just fold the handlebars down to store until next winter. Some machines come with special extras like heated handles, power steering, or other gadgets. While these gadgets are great for making the job more bearable, given the time they have a tendency to break down faster. Instead, you can expect to get a solidly constructed machine that can withstand the cold conditions and is easy to start and operate. More about features and extras below. This Ariens snowblower (Model 920014) has an electric startup for when the unit refuses to startup on extra cold days. Simply plug the unit into a grounded outlet and start like you normally would. Unplug and you’re ready to use. No one wants to be outside longer than they have to on chilly days. 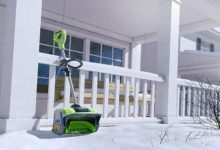 With a wide clearing path of 24 inches, you can tackle large driveways or spaces with less time than you would with anything smaller than 24 inches. Whereas a driveway used to take you several passes to clear, you can cut the passes down considerably so you can get back inside faster. The only recommendation we have is spraying or wiping down the chute and intake with some spray wax or carnauba wax. This will prevent the snow from sticking and jamming up the snowblower. 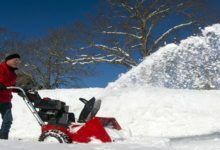 Winter doesn’t last forever, so you’ll need to keep in mind where and how you want to store whichever snow machine you pick. Ideally, you’ll pick one that can easily fold up and that doesn’t take much room. The compact design makes it not only easy to handle and maneuver, but you can also fold up the handle when the winter season passes. Different people cover ground faster or slower than others, so you need a machine that can keep up without making you feel like your stuck behind a slow machine, or like you’re just barely hanging on. 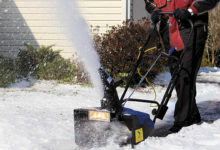 The Ariens compact snowblower has 6 forward speeds and 2 reverse speeds, so if you want to go faster or slower, you can. Some snowblower units come with a light that helps light up your path at night. This one does come up with a pre-installed light, but the light is mediocre compared to some other units on the market. Some consumers have suggested purchasing a replacement light or just using a headlamp. This may not bother some, but it’s definitely something to keep in mind. The majority of the paths you’ll clear will require you to move forward, but sometimes that reverse gear is necessary for going over a certain area again, or even backing out of a shop. In fact, it’s not until we get to doing these things that we really start to pay attention to how well or not well this reverse gear works. For the Ariens snowblower, you’ll get two reverse speeds, but some consumers remarked that both are slow. Our suggestion? You’re probably better off dragging it backward or trying to avoid parking it in an area where backing up is necessary. Some say this snowblower is heavy and others argue that it’s lightweight compared to some other snowblowers in the same class. It doesn’t make a difference until you try clearing some heavy snow and the snowblower seems to glide right over it without making so much as a dent in the ice or snow. Some buyers complained about this occurrence while others reported this doesn’t happen at all. This is mainly down to the difference is snow conditions. Packed wet snow may make it more difficult for this machine to break up, but it’s hard to say without being there for ourselves. Consider picking up some chains to go with it. While the tires are designed for maximum traction, they sometimes have a difficult time going up steeper inclines. We recommend picking up some tyre chains to give it that extra bit of traction. A luxury for some but a must for others, there is no heated grips fitted as standard so make sure that you have some warm gloves to wear. 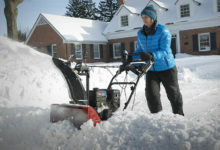 The price for the Ariens Compact snow blower machine is average. 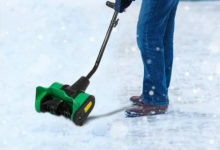 It’s certainly not cheap, but if it will handle most snow conditions without a problem which could be worth it for you. Areas where you maybe get a few inches of snow per year are probably best looking at a snowthrower instead. These light-duty machines can handle light to moderate snow conditions without causing the user strain. 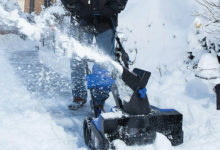 If however, you have a large area to clear or have a deal worked out with the neighborhood, this Ariens Compact model is perfect. Most people loved this snowblower and had very few complaints. A quick looks at Amazon reviews will give you a good idea of what to expect from this machine. Not only that, but Ariens have slapped a 3 year warranty on it to give you further peace of mind. Those who didn’t, seemed mostly upset over this unit lacking some of the luxury features like heated handles. In addition to that, it can be slow to reverse, so you’re just better off dragging it backward without messing with the speeds. If you can put those differences aside and want a quality machine that will last, then this might be the one for you. 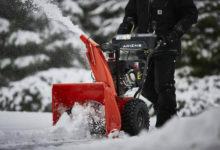 The Ariens compact 24 inch snowblower can handle moderate to heavy snow conditions without breaking down. A 24-inch clearing path means people with large driveways or a lot of sidewalks can get the job done quickly with the least amount of passes. The pre-installed LED light is bright enough to light up your path, but don’t expect to see too far ahead of you. Maybe wearing a LED headlamp in addition to machine’s headlight might help some. Price wise, we think the only person that could justify purchasing this unit is someone needs a machine that can hold up to heavy snow loads. Someone who lives in an area that gets hardly any snow can probably find a cheaper unit. You didn’t read the instructions or you would know that the right wheel can be engaged as a drive wheel just like the left one. I bought mine at Bomgaars and they built it the same. Right Wheel was free wheeling while left was locked in for traction. It’s an easy enough fix, but if you read the instruction manual Ariens has a mention that it’s best to leave one wheel free. You still have to use the pin or your tire will fall off, which is why there are two pin holes in the axle shaft. Personal experience talking here. Otherwise it’s good blower, This is my 2nd one which is much smaller and lighter than my old 36 inch Tecumseh. Overall performance is strikingly impressive for a smaller blower. I do recommend tire chains as these will not climb an incline very well.